Badge of the Ship Constructors and Shipwrights Association. As shipbuilding made the switch from wood to iron and sail to steam, the old established shipwrights’ associations found themselves a minority union behind the United Society of Boilermakers and Iron and Steel Shipbuilders. Their answer was to federate, and in the decade from 1872 onwards an Associated Society of Shipwrights largely succeeded in bringing together most of the local and specialised societies under a single banner. But despite growing rapidly in private dockyards and establishing a 48-hour week for its members in 1894, the society proved unable to win recognition in the naval dockyards, where a separate Ship Constructive Association was formed. Between 1900 and 1910 the Associated Society succeeded in consolidating union organisation further by absorbing local organisations in Newport, Gloucester and on the Wear – and taking over smaller national bodies, including the Ship Constructive Association. The Trades Union Congress has a long tradition of producing badges for delegates to its annual congress. The earliest known surviving example dates to 1901, and can be found in Unison’s trade union badge collection, although the Amalgamated Society of Engineers produced a badge of its own for TUC delegates back in 1893. The Trade Union Badge Collectors Society spoke to Keith Faulkner, Senior Events Officer at the TUC and the man responsible for producing each year’s new badge, about how he approaches the task. 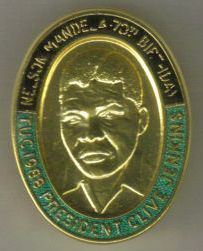 Clive Jenkins' choice of badge for TUC 1988. TUBCS: How did you come to be the person responsible for the annual Congress badge – presumably it’s not the whole of the day job? Keith Faulkner: Back in 1988, when Clive Jenkins was President and General Secretary of MSF (Manufacturing Science Finance), he wanted something other than the standard badge, as produced over many years. As the TUC’s in-house designer at that time, I was asked to liaise with his office and the manufacturers to ensure the result was achievable. Ever since, I have been the person responsible for the badge, as one very small part of my current job as Senior Events Officer. TUBCS: Tell us a bit about how each year’s badge is developed? In recent years each has had its own theme. What part does the incoming president play in developing the theme and the design? Keith Faulkner: Clive “broke the mould”, and in many but not all years the President has wanted something more – as shown by John Edmonds (1988), Hector MacKenzie (1999), Tony Young (2002) and Nigel de Gruchy (2003), when the Congress slogan was also adopted. In many other years, the President has wanted their own personal preferences included, as Rita Donaghy (2000), Bill Morris (2001), Roger Lyons (2004) and Jeannie Drake (2005). But equally, some Presidents have adopted a more straight forward approach as Leif Mills (1995) and Tony Dubbins (1999). TUBCS: Who actually designs the badge, and how does the design get translated into the solid piece of metal art that delegates receive? Keith Faulkner: The normal process these days is that the President is asked what overall approach is desired, and previous examples and basic layout approaches provided for their consideration. Once an approach/theme has been decided, further layouts are developed until such time as the President is happy. The badge manufacturer – currently the very excellent Badges Plus of Birmingham – then takes the basic black and white artwork and uses this to make the mould from which the basic badge is made, and then in-fills any colour and adds an appropriate “pin”. TUBCS: Do you get any feedback from people when they see a new badge? Keith Faulkner: The badges are normally only seen around the Saturday lunchtime two days prior to Congress; so immediate responses are rarely given because the President is already by then heavily involved in the processes of Congress itself. However, comments are usually made in the following couple of days. TUBCS: There is a long tradition of Congress badges going back over a hundred years, including a porcelain badge to mark the 1905 Congress which took place in the Potteries. Have you ever looked back at some of the early designs, for inspiration or just out of curiosity? Keith Faulkner: The developing design(s) are certainly of interest out of curiosity but, due to different materials and production methods and the desire of Presidents to have a punchy slogan, inspiration is not a reason to look back. TUBCS: What do you have in mind for 2009? Keith Faulkner: Consideration will probably not begin until around May for the Congress 2009 badge when the current President – Sheila Bearcroft of the GMB – will be contacted and the process started again. Badge of the Association of Women Clerical Staff. Founded in April 1903 with just 64 members, and originally known as the Association of Shorthand Writers and Typists, the union’s first president was the Fabian intellectual and trade union historian Sydney Webb. It became the Association of Women Clerks and Secretaries in 1912, and from that point on organised only women workers. 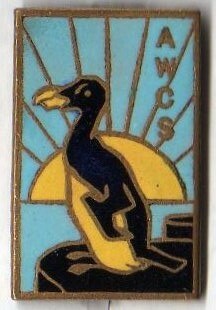 Its badge shows not a penguin as it might appear but an auk – the union’s name being abbreviated to AWCS. Though never large, the union survived until 1941, when it amalgamated with the Clerical and Administrative Workers Union. In 1972, it became the Association of Professional, Executive, Clerical and Computer Staff or APEX (and has since 1989 been part of the GMB). One of the AWCS’ leading members, Anne Godwin (1897-1992), who had become general secretary of the CAWU in the 1950s, became only the third woman president of the Trades Union Congress, serving in 1961-62, shortly before her retirement. The union’s surviving records can be found in the Working Class Movement Library.